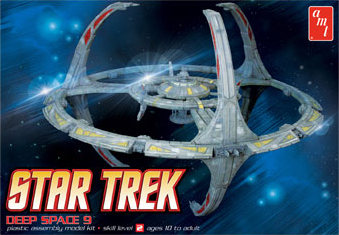 This kit represents the namesake of the 4th Star Trek television series, Deep Space Nine. The station was strategically located as the first line of protection for the federation from dangerous aliens traveling through a nearby wormhole. Included is a brand new mini kit of the U.S.S. Defiant, the battleship that was assigned to protect the station from Federation enemies. The kit returns to production injected in clear plastic that allows modelers the ability to light their model. (light kit not included). New window decals are also included to supply detail for those that desire a finished look without the need to light the model. Fans remember the iconic handheld props from Star Trek: The Original Series like the iconic communicator, a precursor to today’s common cell phones. 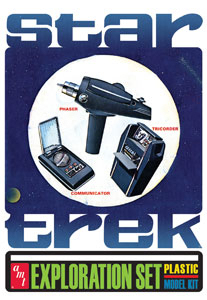 AMT is proud to bring back this classic kit depicting a trio of favorite Trek props- the communicator, phaser II and tricorder. The miniatures are “kid size” and offer plenty of detail that is augmented by a bonus sheet of photoetch brass parts.